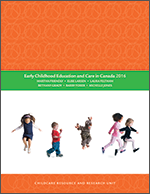 This report, published by Human Resources and Skills Development Canada, is similar in format and information to previous editions of Early Childhood Education and Care in Canada (1992, 1995, 1998, 2001, 2004, 2006, 2008) developed and published by the Childcare Resource and Research Unit. Data is provided for each province and territory as well as for the federal government. Comparative and longitudinal tables are included. The full report is available online only and in French.